Super nice hostel with a really great atmosphere. The people working here are all great and super helpful. Definitely would stay again! Excellent hostel. Amazing staff, great location. I would highly recommend you stay at this hostel. 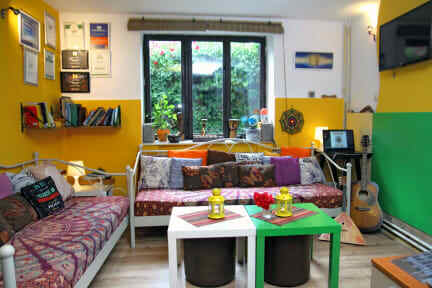 Laid back and relaxed hostel ten minutes walk from the bus station and the center of Skopje. 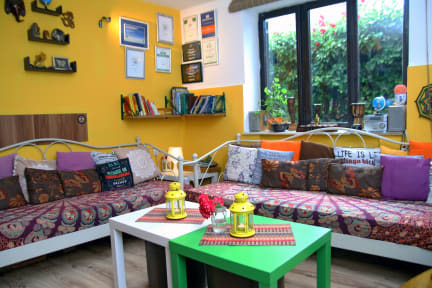 Wonderful staff, chilled out common room and great out door area for the evening. Facilities are of high quality and the beds are comfy. Kiki was very kind and helped us with everything needed. This truely is a special place to stay. This is a great hostel, very close to the bus station. The old town and main attractions are jut 10 mins away so that wasn’t an issue. Free breakfast is simple but nice. The staff were really nice and gave me good tips for food to eat and places to visit. Amazing value for money! Shanti is an amazing hostel. It is incredibly clean, very comfortable, and the staff is kind and always available for any questions you may have. If you are thinking of visiting Skopje, definitely stay here. This place is really something, we need more points for atmosphere and staff. Peter and Kiki are too good to be true and the homy feeling is overwhelming. You are bound to meet some cool people. Beds are great and have curtains, with plugs and light. Towels included wich is a godsend. Breakfast is standard plus and bus station for early trip to the cross and Matka Canyon is like 5 minutes away. Thank you very much dudes. I had a great time at Shanti Hostel, It felt very laid back, comfortable and the staff were very friendly, co-operative when I had questions for them and super professional. A really enjoyable stay. Visited in low season, so there weren’t many other guests, but the night I saw people was really enjoyable and fun. Staff were really helpful via email and from arrival. Location was about a 15-20 min walk from the main square which felt safe walking home in the evening. Small shop and bakery round the corner. I stayed in the apartment which was clean and good facilities. Thank you for a nice stay, would def come back next time I’m in Skopje. Place was nice, staff sleeping in the reception next to the kitchen. made me feel guilty for waking up before 9:00am. Shanti Hostel is about a 5 min walk from the bus station. The neighbour seems a bit run down, but this is because it is a 'protected zone' being one of the few areas that survived the 1963 earthquake in-take. The bunk rooms are arranged really well, with reading lights and power points for each bunk. The bunk rooms are up a very steep circular steel staircase while the toilets are downstairs, so you probably don't want to get up many times during the night to go to the toilet.